Italian handleless kitchens like our ranges from Bontempi are exquisite and enchanting. Just as a conductor waves and elicits responses, you can simply slide elegant drawers with a feather touch. Contemporary and stylish, hiding a whole lot of engineering sophistication behind their extreme good looks, these Italian handleless kitchens present a sleek, streamlined appearance, melding form and function in a harmonized system. It is sheer delight and joy to work in these kitchens and when you have guests, show them off to your heart’s content. 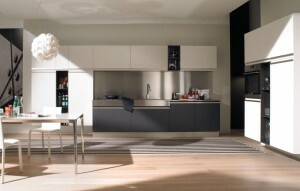 The best thing about Italian handleless kitchens is that you do not have to settle for a standard style. Customize your kitchen around your preferences in terms of functionality and looks. Revel in this, your very own paradise of a work place where your culinary creations will scale new heights of perfection. 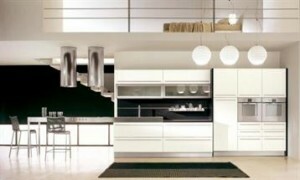 MOODevo Italian Kitchen – People often complain about there never being enough space in the kitchen. The Mood preject is the result of total focus on maximising all the available space, and its entire layout is arranged so as to offer the most diverse functional and styling solutions, in the language of architecture. The compostion solutions illustrated afford the largest work surfaces, the most capacious storage units and offer the most diverse styling solutions, from simple linear and corner compositions, to freestanding central configurations. 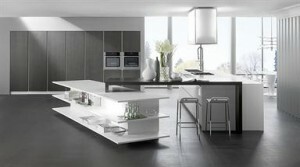 Bontempi Italian Kitchens are typically Italian, full of passion and creativity and Wave, is a stunning example. A smart way to store everything, every square centimetre made to be useful with the creativity communicated through space. Thanks to this contemporary and decorative concept, the kitchen is kept in impeccable order. With Wave from Bontempi everything that is concealed from your sight has a distinguishing trait! 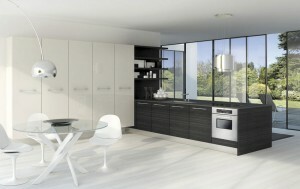 Alpha 2 Italian Kitchen – A luminous, natural, technically advanced project, where purity harmonises with functionality. 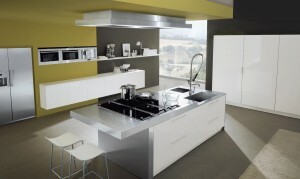 A kitchen that suggests authentic, uncontaminated space, whose components are designed with rigorous lines: horizontal surfaces meet discreet technical details, such as stainless steel feet and the aluminium profiles of the concrete laminate worktop; the severe volumes are punctuated by aluminium grooves; the heavy duty steel top sets off the candour of the white surfaces, restoring each element to a primitive geometry. Opera Italian Kitchen – The intention was to convey the beauty of the major classical works to the kitchen enviroment in an enthusiastic way coupled with modern day verve. Materia Italian Kitchen – As part of our ongoing research and innovation activities, we devised Materia, a brand new concept, somewhat different, capable of telling the tale of another kitchen, the one that never forgot about gastronmic materials and memories. Area Italian Kitchen – The programme has focussed on a design without handles and on a horizontal approach to the different door models and price ranges. 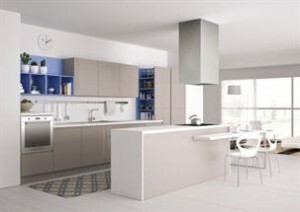 ‘Zero’ Italian Kitchen – The Zero kitchen is consisted of modular units, with bi-laminate doors available in two different options, either a simple linear handle to match the colour of the door or a completely handleless version. Owing to the extreme adjustment of the Bontempi Cucine units, a wide array of design solutions can be created, thanks to the broad range of features which can be fitted to help create a single perfectly co-ordinated atmosphere. Indeed, ZERO from Bontempi gets its recognition in terms of creativity.